Elvis' first night at his new home. I gave him this teddy bear so he wouldn't miss his brother, Marty too much. Marty lives with my son and his family. 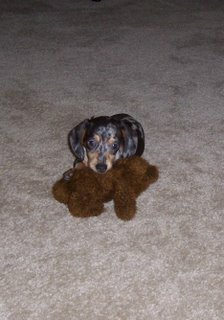 Elvis is a blue dapple mini daschund. He was born Dec. 6, 2005. He probably weighs 2-3 lbs, but will grow to about 8 lbs. He is a sweet, smart little guy and I look forward to lots happy times with him.